Google Drive for Mac/PC syncs any or all of your files to Google Drive on the web, making them available anywhere, at any time, on any device. It also provides secure cloud-based storage for your files. A new version of Google Drive for Mac/PC is rolling out this week, featuring a new, more visually rich status menu. 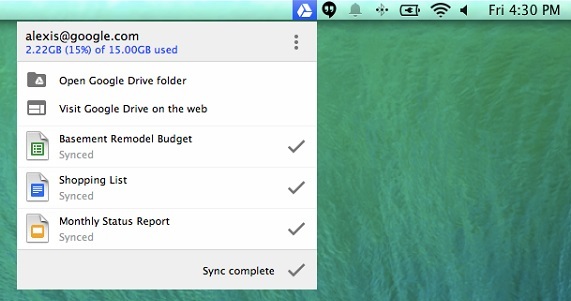 The menu allows people using Google Drive for Mac/PC to more clearly follow their sync status, including guidance on already synced files, files currently syncing and files yet to be synced. When you hover over a recently synced file, you’ll see an icon that saves you steps by letting you share it right from the menu. You can also now choose to limit how much bandwidth Drive consumes while syncing your files for those times when you need extra bandwidth for something else. You can do that in the Advanced section of the Preferences menu.